More than 10 years ago, the Army introduced the concept of the advanced individual training platoon sergeant: A noncommissioned officer who would lead new soldiers, fresh out of basic, through their second round of training before heading into their first units. The AIT platoon sergeants replaced the intense, omnipresent force of the drill sergeant in that second step of training — but it may be time to rethink that move, according to the top soldier at Training and Doctrine Command. “I think what may have happened was, it’s a good idea, but it’s not what we need,” Command Sgt. Maj. Dave Davenport told Army Times on Oct. 10. As the Center for Initial Military Training studies the entire structure and curriculum of initial entry training, from basic and AIT over to one station unit training, Davenport said he believes drill sergeants in AIT would solve some of the loose ends the Army is seeing in new soldiers. The larger organization is also looking at the ratio of AIT platoon sergeants to trainees, to see whether closing that gap might make the difference. But, Davenport said, the storied figured of the drill sergeant could probably do better. Drill sergeants are assigned at a 7-to-1 ratio in basic training, but when soldiers move on to their military occupational specialty training, that ratio becomes more like 20-to-1. The idea was to give soldiers more leeway during AIT, preparing them for what it will be like in their first operational unit. But, according to the head of the Center for Initial Military Training, brigade commanders say they’re still getting undisciplined, out-of-shape soldiers in their formations, who have just come from initial entry training. Frost commissioned a study in September to look at the entire Army basic training base, to include the length and content of basic training, training and education for drill sergeants and AIT platoon sergeants, as well as workloads for those NCOs. But the idea of bringing drill sergeants back to AIT has been bubbling for a while. 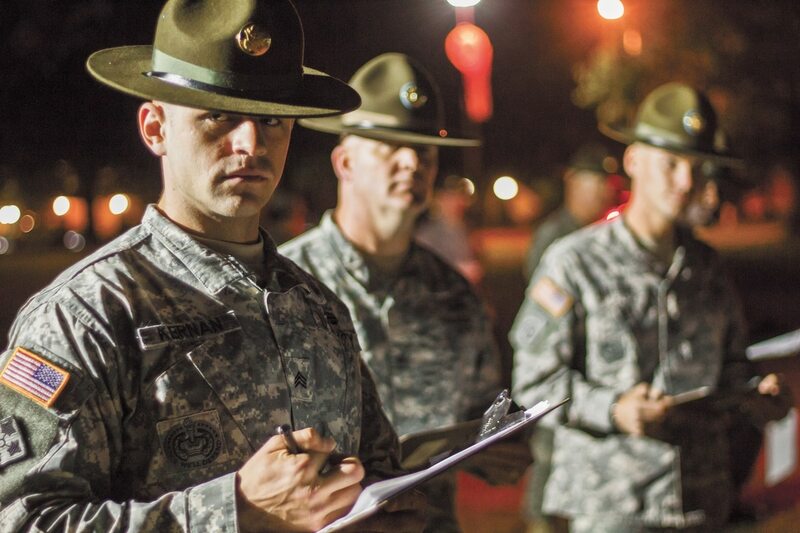 Drill sergeants cut an intimidating figure at basic training, and the job comes with perks like a uniform badge, special pay and a distinctive cover.